I was met at Accra Airport by the smiling face of Kwabena, our host for our overnight stay in Accra. We sat and chatted and waited for Laura and Manhar, the other two volunteers arriving at the same time as me. 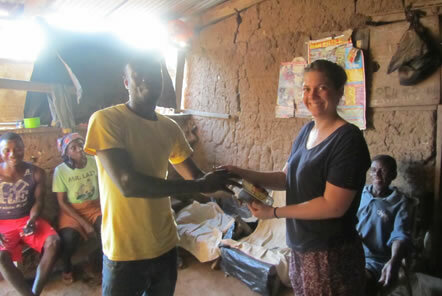 Once we had all assembled we made the short journey to Kwabena’s home, where we spent the night, to be collected the next morning by Aikins, our wonderful volunteer coordinator! After a brief trip to Accra mall to buy sim cards and stock up on some tasty treats, we began the two hour drive to the village where we would be staying. The journey was absolutely beautiful! As we climbed up over the hills a stunning view accompanied us. To one side, the whole of Accra stretched out, with the hustle and bustle still just about audible, and to the other side the lushest jungle I have ever seen! Soon the road gave way to dirt track and we knew we were nearing our destination. As we pulled up into the village, we were greeted by some of the children; all smiling and interested in us and very excited for our arrival! Volunteers all live together in a communal base in dorm rooms, one for men and one for women. Margaret and Maadwaa, the base cleaners, come everyday and keep everything absolutely spotless. 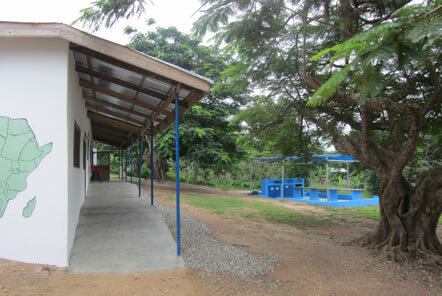 There is an outside enclosed area for showering using the bucket showers and there are also male and female long drop toilets. 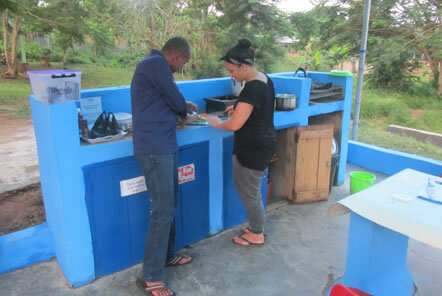 The base has a common room as well as an outside cooking and eating area where volunteers can sit in the evenings. The views are simply stunning. With lush jungle stretching out over the hills in the distance you truly feel like you are in paradise! My favourite part of the base by far in the designated hammock area – when you have finished a hard days graft, there is nothing like lying in a hammock in the shade to escape the African sun and listen to the glorious sounds of this village! Volunteers all cook together and so we drew up a rough rota so that we all had days on and off duty. On Tuesdays and Fridays volunteers all go to the market to buy food and ingredients for the next few days. The market is a busy place, full of rich sights, sounds and smells! We purchased our vegetables and fruit, as well as taking the opportunity to buy some African wax-print material as souvenirs. 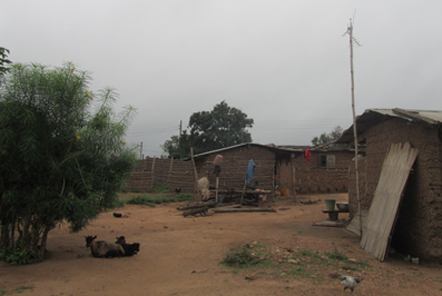 The village itself is small but sprawling, with mud houses in clusters surrounded by growing crops. Goats and chickens freely wander here - it took me a day or two to get used to the morning cockerel chorus as my alarm! When we had been in the village a couple of days, we received a cultural lesson from Master Gyampoh. He is the one of the teachers at the school and is a skilled linguist. He taught us basic greetings and useful phrases for working in the school as well as answering many of our questions and chatting to us about the local culture. We were also taken to meet the chief and present him with a bottle of locally brewed alcohol, he then blessed us and our time in the village. Mornings on the Child Care role are spent in the crèche working alongside the teacher, Madame Adelaide. It is always busy and hectic, but so much fun! The children arrive at 8am and the days usually begin with a song and a dance, led by Madame Adelaide. Throughout the morning, our wonderful volunteer Laura ran games and activities. The puzzles, stacking cups and puppets were a huge hit with the children! After lunch, Laura handed out card cut outs of a person and we all had great fun colouring in. The children loved having something to take home at the end of the session too. In the afternoon, volunteers run after school classes with the children. 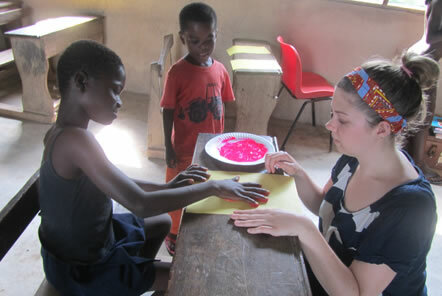 In the first session, we took along coloured paper, felt pens and stickers and the local children turned up to take part! They loved having the free time to draw and colour. In our next after school session, Laura had the absolutely brilliant idea to get the children using the hand paint to make the flamingos! The children had a great time, and returned to their parents with their paintings and (hopefully) not too much pink paint on themselves! Myself and Laura headed out to a local village for a morning of baby-weighing. All mothers are encouraged to bring their children aged between 0 - 5 years old to the clinic (which was built by the charity) once a month to receive advice about development and diet for their baby as well as vaccinations and the weighing of the child. Our role was to look after the other children whilst their mothers talked to the nurses and assist with the baby-weighing. To weigh the babies, they are placed into a small sack which is then hung from the scales to gauge the weight. The mothers and babies were very welcoming to us and it was truly a privilege to see the great work being done by this clinic in aid of the community. At 8am all the children arrive for school assembly which is led by King Lord Yobo, a senior teacher; it is a really nice way to begin the school day. Our volunteers on this role can, depending on their level of confidence, spend time assisting the teacher whilst they teach, taking small groups out to work on their English conversational skills or leading the whole class. 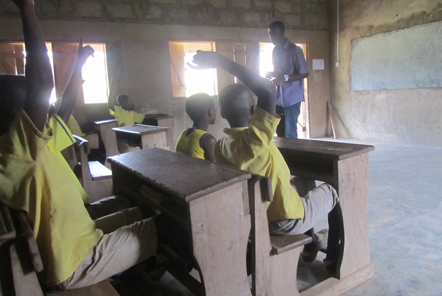 I spent some time in King Lord Yobo’s class, he was teaching the children an English lesson and they were focusing particularly on phonics. The children were willing and eager to learn and responded really positively to his praise and encouragement. The lesson was very interactive, and so we spent time with children talking and phonetically sounding out words. The children really enjoy having different people in the class and different people to learn from. In this village, as in other neighbouring villages, the charity runs a Girl’s Empowerment project. As part of this, some of the young women in the village, the girls aged between 14 years and 18 years old, are part of a football team. Emmanuelle, who is the charity sports coordinator runs twice weekly sports coaching sessions with the girls, and the girls also compete in twice weekly matches. I went along to Emmanuelle’s coaching session and cheered on the girls and helped out. What was really lovely to see was that the younger girls watching the older ones and copying them – this project is inspiring the next generation without even realising it! We travelled about half an hour to a village called Otwetri, where the project is busy building a health clinic. This clinic will serve the people of this village as well as the neighbouring villages and hamlets. Currently the villagers need to travel to a local bigger town called Adawso for any form of health care – a difficult and bumpy journey in normal conditions however if there is even the smallest amount of rain the road to the village becomes undriveable. We heard stories about women, who in full throws of labour, were having to be carried of a makeshift stretcher up the road so they could get the health care they so desperately need. This clinic will have a labour ward as well as a doctor’s and nurse’s practice rooms and will be fully staffed so everyone who needs treatment can receive it. 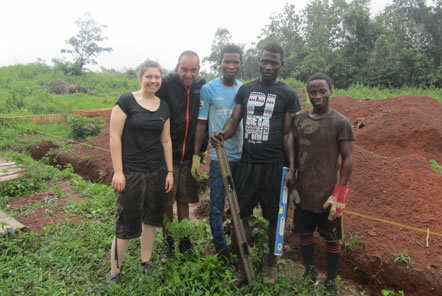 So far the local team, with the help from volunteers, have marked out the land and dug the trenches ready. Next step – laying the foundations! First we had a safety briefing from Brendan, the project manager. Under the steady guide of Brendan, the local team and volunteers together got to work. 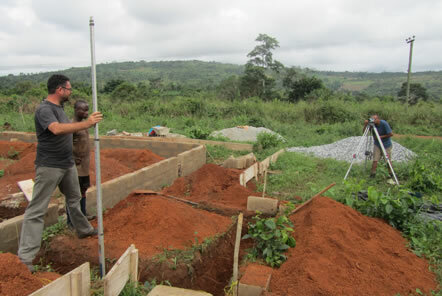 Today’s tasks; mixing cement, moving and laying blocks and measuring out the entrance way to the clinic. The local team work well together, to coordinate the build, instructing our volunteers and ensuring that everyone is given a job that they can manage! As this is Ghana in the height of monsoon season, after a few hours of happy working the rain began to lash down and we had to call off work for the day - it didn't dampen out spirits at all! It was increidbly rewarding to look back after a morning's hard work and see what we had achieved. 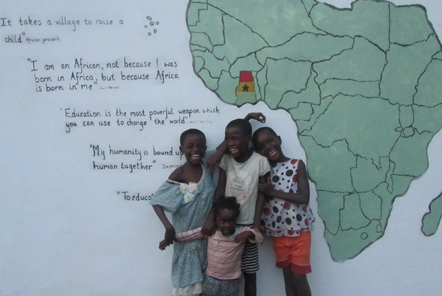 The film and photography role in Ghana is a great opportunity to get involved using your skills to benefit the charity at a wider level as well as the local community directly. For the film and photography role I have been documenting the amazing work done by the charity! My films and photos, taken of the building work that is going on as well as the excellent work taking place involving the children and women’s empowerment programmes, will be used as documentation of the charity initiatives. Whilst on this role, volunteers have also been able to get involved in creating films that can be used to educate the community on the health and social issues in the village. Previously, film and photography volunteers created and educational film about the importance of hand washing and the charity played this to the village through their projector – Aikins, the volunteer coordinator, let me know that everyone loved it! 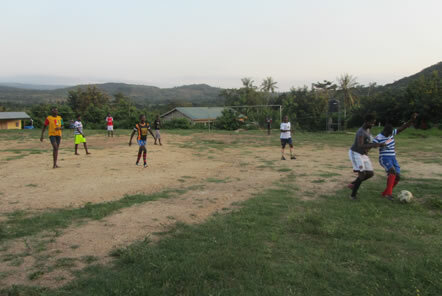 Whilst in Ghana, I was lucky enough to experience some of the activities in the local area. 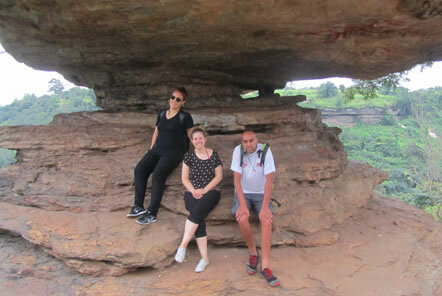 Myself, Laura and Manhar travelled out to visit Boti Falls and Umbrella Rock. Boti Falls is a huge imposing waterfall with a fascinating tribal history that our guide Gideon filled us in on. It Is possible to swim in the water below the waterfall however we opted to just paddle! 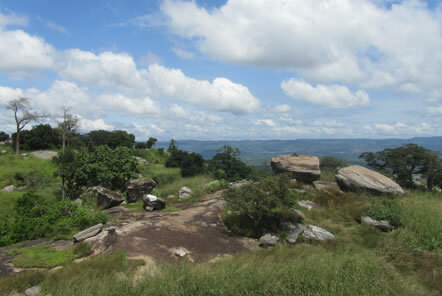 Gideon then took us over to visit Umbrella Rock which is an impressive natural rock formation! It is an overwhelming structure, looking out over the jungle. After all this we made our way to the bead market in a local town called Koforidua. It was great to wander past the stalls and buy little trinkets and pieces of jewellery for keepsakes. The market was busy and bright, with beautiful colours everywhere! I was also given the fantiastic opportunity to climb Mount Krobo with Brendan, one of the volunteer coordinators, and Manhar, one of my fellow volunteers. It was incredibly hard work in the baking sun but after a couple hours of scrambling, we made it to the top. I can honestly say I have never seen such beautiful views in my whole life! We had a full 360 view of the stunning savannah to one side and the villages and man-made lake to the other. It was such an adventure from start to finish and I am so glad I was lucky enough to do it! 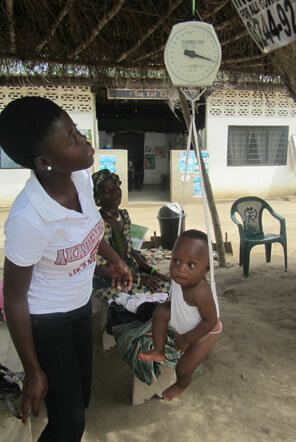 If you would like to find out more about the volunteering opportunities in Ghana, please see here.